Philly left us in awe when HiJinx Festival announced the jaw-dropping lineup for their first-year festival. There is no doubt that headliners like Bassnectar, Odezsa, Big Gigantic and Griz, and additional artists such as Whipped Cream, Xie, Denzel Curry and Dorfex Bos will leave everyone in the greater-Philadelphia area wanting to attend. But HiJinx has so much more to offer than just their impressive lineup. Here are five other reasons why HiJinx is the destination to celebrate this New Year’s Eve. The Pennsylvania Convention Center is a superb location for a music festival. The six-block structure is home to the largest ballroom in the Northeast and is located in the heart of Philadelphia’s downtown. It is filled with striking Pennsylvania art and cultural pieces and gives incomparable views to Philly’s historic City Hall. It is easily accessible by bus, train, subway and taxi; and many of you won’t need to travel far to get there. In fact, the Pennsylvania Convention Center is within a day’s drive for 40 percent of the U.S. population. So, forget about expensive plane tickets and traveling cross-country, HiJinx offers an affordable New Year’s Eve destination in a superlative venue. What better way to celebrate New Year’s Eve than in the birthplace of America? Not only is Philadelphia filled with an abundance of hotels, boutiques, shops, restaurants, theaters, parks, art galleries, sports and recreation venues, and nightlife locations, but it is also home to America’s Most Historic Square Miles. Independence Hall, the Liberty Bell, the National Constitution Center, and Elfreth’s Alley, the oldest inhabited street in America, all lie within this one square mile. And let’s not forget about the food—where else are you going to get a Philly cheesesteak that’s worth dying for than in the reputable city itself? With an extra two days between the festival and the actual new year, you will have plenty of time to explore the city and participate in all the acclaimed festivities. The name “HiJinx” says it all. Loud, energetic, cheerful activity is exactly what will be happening at this celebratory festival. Just as it says it all in the name, the portrayal of the festival should give more insight of what is to come. Psychedelic, vibrant colors reside as backdrop to the advertisements themselves as the name HiJinx is placed above an ever-seeing eye. Will this first-year festival give insight to the future of 2019 or open your third eye? One can only hope. But will this monumental event in the City of Brotherly Love be one that you won’t regret? Without question. We all know that Rick and Morty is a huge fad within the festival scene and there is no reason why it shouldn’t be! Rick and Morty is iconic. If a snippet of Rick or Morty’s voice is not played once during a festival weekend, then we can probably all say we are pretty disappointed. Everyone needs to get Shwifty once in a while. That means HiJinx is obviously doing something right by using Rick and Morty to hype up their festival endeavors. And who’s to say that the two won’t even be attending the NYE celebration too? I’m sure you’ll be seeing quite a few pickle costumes headbanging around the grand ballroom during these winter nights. This is HiJinx Festival’s very first year on the festival radar. That means no prior expectations, no prior comparisons and no prior memories. Everything is brand new, which is how you should be feeling while entering into this new year! New goals should be set, new destinations should be reached and new places should be visited during 2019. Attending this new festival sets precedence for a new and improved you! Nothing holding you back and nothing taking you back to your past. HiJinx and 2019 go hand in hand—they’re both the beginnings to something worthwhile. 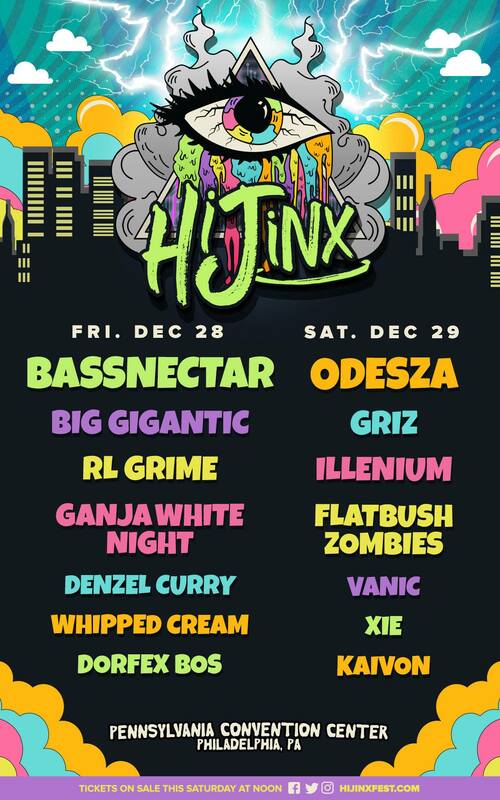 That is why you should make HiJinx Festival your destination to celebrate this NYE. Be sure to grab your tickets to this inaugural event before it’s too late! December 28 and 29 will be here before you know it!